Releasing on DVD and Digital HD on June 27th courtesy of Lionsgate is the complete series of Power Rangers Dino Super Charge! 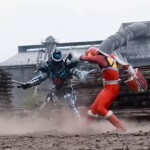 In this second half of the Power Rangers Dino Charge series, the Power Rangers search for the remaining two Energems while facing a new foe – the villainous Snide! But as the Power Rangers conclude their quest for the Energems, an even darker evil emerges and the Power Rangers will have to get creative in order to save the world! 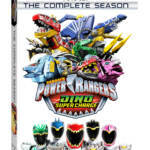 Power Rangers Dino Super Charge the Complete Series will release June 27th for $19.98. Click “Read More” for the full press release! It’s time to finish off the year with the conclusion to Power Rangers Dino Charge on DVD with Power Rangers Dino Charge Hero. Releasing from Lionsgate on DVD and Digital Media on November 1st, 2016 for $14.98, this DVD will finish off your pre-Supercharge collection of Power Rangers Dino Charge DVD’s! When the Power Rangers Dino Charge head to New Zealand after spotting activity from Sledge, the Rangers are shocked to see a brand new ally – the Purple Ranger – and quickly act to have him join the team! But alas, when the Purple Ranger chooses to forego being a Power Ranger, it’s up to our heroes to find a new Purple Ranger … and they’d better hurry before Heckyl, a new villain, makes his move! This DVD also includes the bonus Christmas episode, “Race to Rescue Christmas”. 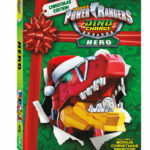 Power Rangers Dino Charge Hero DVD releases on DVD and Digital Media on 11/01/16 for $14.98! Reserve your copy today! After a few weeks of speculation on when the annual hiatus would begin for Power Rangers Dino Supercharge, Saban Brands drops the episode preview and episode preview still images to the Power Force revealing that, indeed, this weekend is the last new episode of Power Rangers Dino Supercharge for the foreseeable future. In this episode, “Riches to Rags“, a hybrid monster uses a spell to make those who take his gold coins become greedy while Ivan laments over destroying a thousand year suit of armor and ends up in debt. Watch the mid-season finale of Power Rangers Dino Supercharge this Saturday on Nickelodeon! Check your local listings for exact times in your area! This weekend is a busy weekend for fans of Power Rangers Dino Supercharge! First, you have Toy Fair 2016 with all new product reveals for the toy line (as well as the popular Legacy line). Then, right after the reveals, you have a brand new episode of Power Rangers Dino Supercharge! In this new episode titled “Nightmare in Amber Beach“, Shelby, the Dino Charge Pink Ranger, receives a pillow from a monster that puts her to sleep! When she awakes, she sees her fellow Rangers as Vivix! Can our heroes stay awake to avoid the same fate, or will Heckyl/Snide finally defeat our heroes and take their Energems? 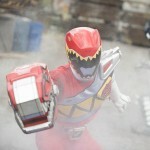 Enjoy two preview images sent to us from Saban Brands! An all new episode of Power Rangers Dino Supercharge airs THIS SATURDAY on Nickelodeon! Check local listings for exact times in your area! Tomorrow starts a brand new season of Power Rangers! The new season, titled Power Rangers Dino Supercharge, is the second season of Power Rangers Dino Charge. In our season finale last year, the Red Ranger defeated Sledge and sent him to his presumed end in the side of a mountain. But it looks like not everyone on the ship perished at the hands of the mountain – the villainous Heckyl, and his alter-ego Snide, have not only managed to survive but take control of the remaining monsters! And now they make their move on our heroes, who have split up following the season finale. The premiere of Power Rangers Dino Supercharge airs tomorrow (Saturday, January 30th) on Nickelodeon! Check local listings for exact times. Check out this video trailer below, encoded in part thanks to the people behind RangerCrew, as well as nine preview images courtesy both PowerRangers.com as well as The Power Force. Get your Dino Chargers ready to Unleash the Power and watch the season premiere of Power Rangers Dino Supercharge! The folks at IGN showed off a brand new trailer for the Power Rangers Dino Supercharge premiere which begins airing on January 30th on Nickelodeon. If you haven’t seen it yet – check it out! As always, there’s a chance this may be released a week early on Nick.com, as all previous premieres (whether season or mid-season) have been in the past. We’ll keep you up to date! Till then – check out this trailer! Some key takeaways – looks like Snide and Heckyl are indeed two separate entities. Also – things look to get serious as we see Heckyl walking in to the base of our heroes! And for those who like to speculate – on Heckyl‘s collar are two distinct colors – red and blue – could the human form of Snide, aka Heckyl, become the Talon Ranger, also known as Deathryuger from Zyuden Sentai Kyoryuger? Time will tell! The premiere of Power Rangers Dino Supercharge is January 30th! All times are GMT -4. The time now is 5:24 PM.